This morning I attended an experience event in Chennai, somewhat similar to Landrover Experience I had attended last year. 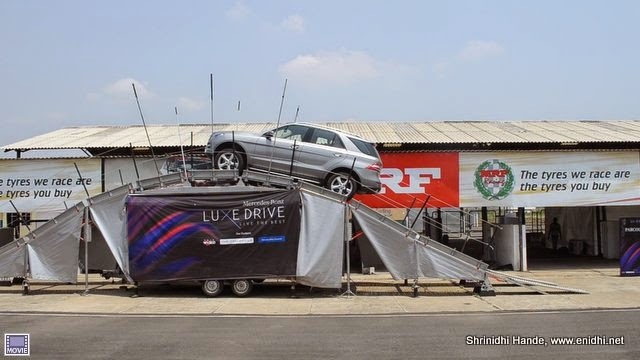 A drive in race track (By Mercedes Benz expert racing drivers, we are not allowed to drive) that demonstrates some extreme maneuvering and safety features of the Mercedes car. When I learnt about this event, I registered and got selected. I guess I was the first to arrive at MMSC Race track today morning. After verifying my registration my license was checked and I was given a green band (which meant I can drive, while red band meant demo only, no driving). We saw brief video of #LuxeDrive ad in an eyegear. Then took a walk around- saw miniature model of Mercedes Benz Cars, other merchandise and had some refreshment. Then we spent a moment at display area, we went to a closed chamber where headlight capabilities, cornering light abilities etc were shown. These are together called ILS (Intelligent Light System). Light that turn with steering and switching to low beam when an oncoming vehicle has high beam, varying light intensity and range etc are indeed very useful features that make night driving safe. Next I went to track, where staff had some hesitation if I can drive automatics and SUVs. I cleared their doubts and after sometime the SUV was ready (GL Class). 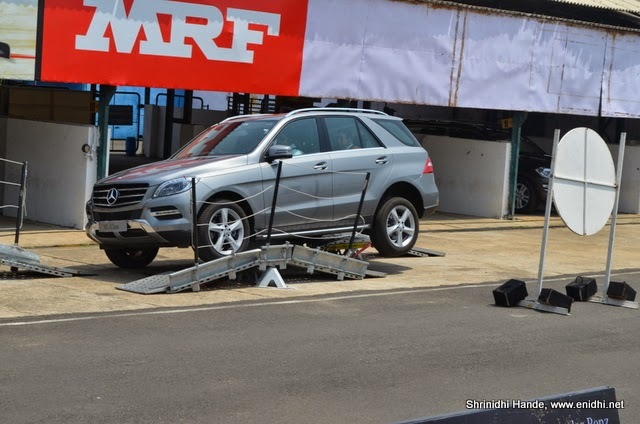 Mercedes Benz racing experts first gave a demo and then let me have a try. Similar to Landrover experience, we drove cross axle, steep banking, climbing a vertical obstacle etc. 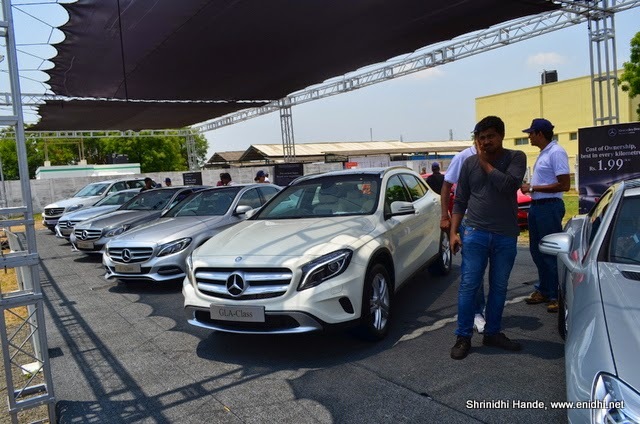 The 4matic four wheel drive system kicked in, managing traction (only wheels that have traction will be powered and those spinning freely will not be supplied power), ride height was increased for offroad driving, vehicle dynamics ensured that car is stable even at steep banks. Once on top of below shown obstacle, hill descent control (Downhill Speed Regulation or DSR) can ensure that car comes down in a controlled fashion. We can set the speed and take our foot off brake pedal, car crawls down slowly and steadily. Brilliant feature. After the SUV exercise, we drove in zig zag manner in a CLA class, clearing red cones and understanding its steep handling capabilities. SLK 350 was getting everyone's attention. 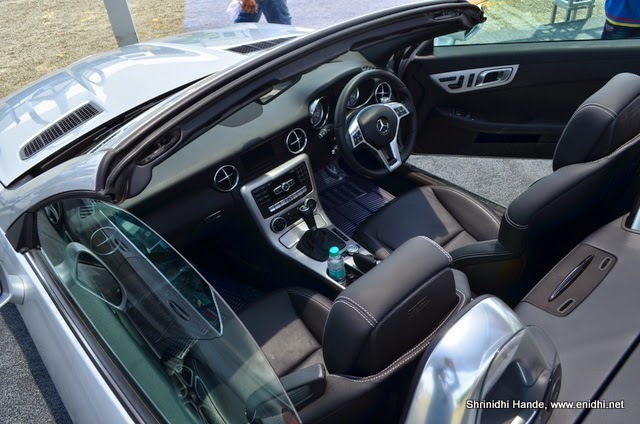 This 1 crore convertible's roof can't be moved when in motion (unlike Audi A3 cabriolet) and has absolutely no space. But assuming you have another car for practical purposes, this is great car to indulge in some serious fun. You can check http://luxedrive.in/ for more details. By around mid noon I came out and headed home. Had plans to understand their leasing schemes etc, but had a flight to catch. Do we need to own a mercedes to experience this? No, you need not necessarily own a Merc to participate. One needs to register and if confirmed you can attend. I Found Very Interesting and Informative Article,amazing captures.Keep sharing us up to date. 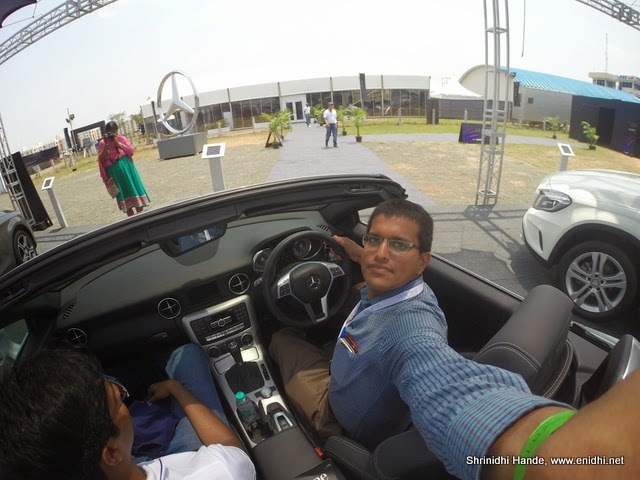 Wow amazing Mercedes test drive.. This is really amazing.... They made a good track for the car to be tested. It must have been awesome fun. Thanks. yes, it was fun.